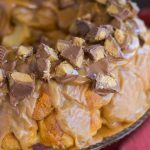 For chocolate and peanut butter lovers’, this Reese’s Peanut Butter Cup Monkey Bread is next level! 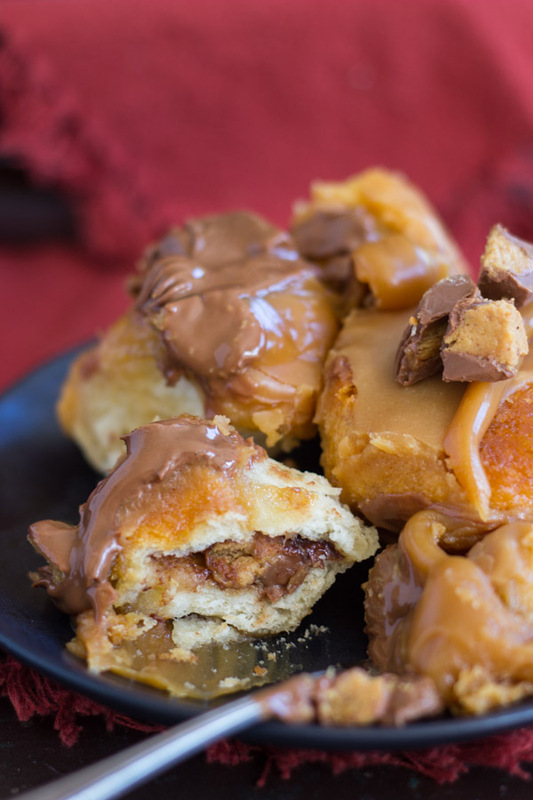 With a mini Reese’s cup inside each bite of monkey bread, and drenched in peanut butter glaze, the decadence is unmatched in this Reese’s Monkey Bread. Hi! I hope you all had a great weekend, and had more exciting plans than me. True to my word, I made a few bacon and peanut butter recipes, and then I researched AC units for the house, and got my tire patched from the big nail that punctured it. But we’re saving all our energy for a big Memorial Day weekend. We usually head out to the beach for the weekend, and meet up with friends out there. I feel like I’ve been firing on all cylinders a lot for the last few months, and it’s high time to unwind. About those peanut butter recipes that I made over the weekend — I made these Peanut Butter Chocolate Chip Pancakes (best brunch! ), and this Reese’s Monkey Bread, obviously. It’s surprisingly been a minute since I’ve posted a peanut butter recipe on the blog, and it’s overdue that I share one with you. 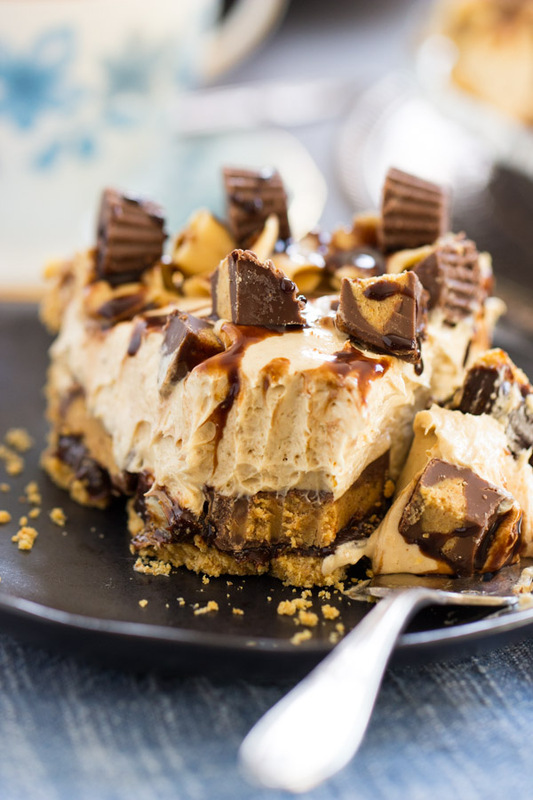 Peanut butter desserts are some of my favorites AND yours, so I feel pretty confident that you guys love the nutty stuff as much as I do. 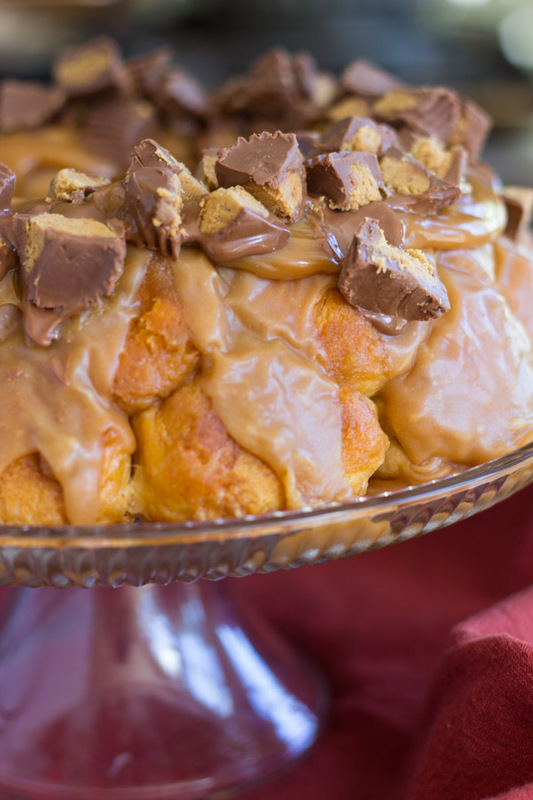 You can’t beat this Reese’s Monkey Bread recipe for ease and decadence. It’s quick & easy monkey bread that starts with refrigerated biscuits. I will never turn down a short-cut. I like to make yeasted breads from-scratch when I have the time and can take a more leisurely approach to baking, but that’s not always the case. Besides, I personally really love refrigerated biscuits, and think they’re flaky, buttery, fluffy, and wonderful. 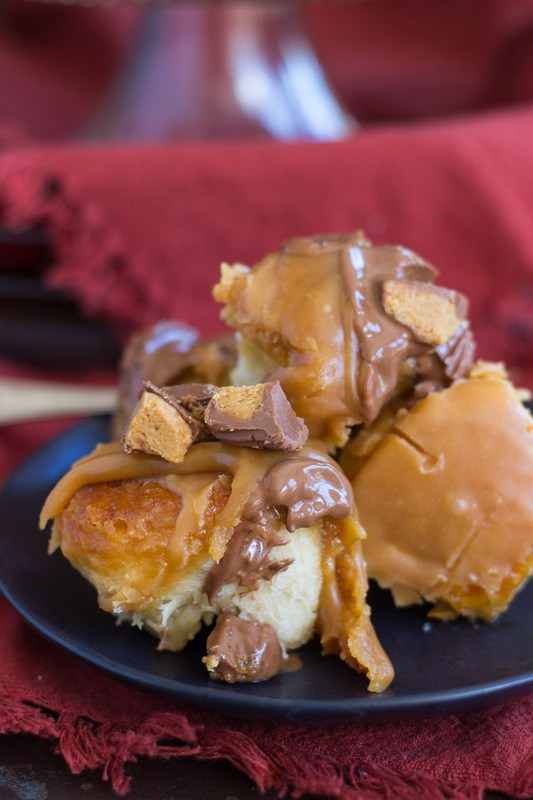 Each piece of monkey bread is filled with a mini Reese’s Peanut Butter Cup. It’s outrageous. Remember when I did that with Snickers bars for the Snickers Monkey Bread? 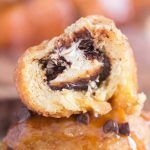 And a slew of candy bars in this Candy Bar Monkey Bread??? Lol. Same idea. The whole thing is topped with a decadent peanut butter glaze. It’s quick prep – about 15-20 minutes to get it oven-ready, and then it bakes for about 30. 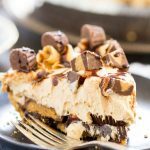 You can have this dessert served up in under an hour from beginning to end, and unless you know people that don’t like chocolate and peanut butter (you should unfriend those people), then this will absolutely be a crowd-pleaser! 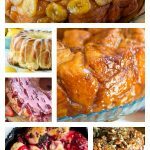 I love short-cut monkey bread recipes, and I’ve got a few others that I’ll link here for you to check out, if you’d like! 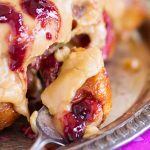 This Honey Cinnamon Monkey Bread is a wonderful version for weekend brunch, and same goes for this delightful Peanut Butter & Jelly Monkey Bread. And this Lemon Blueberry Pull-Apart Bread recipe is pretty much along the same lines as other short-cut monkey breads. There’s a few good options! 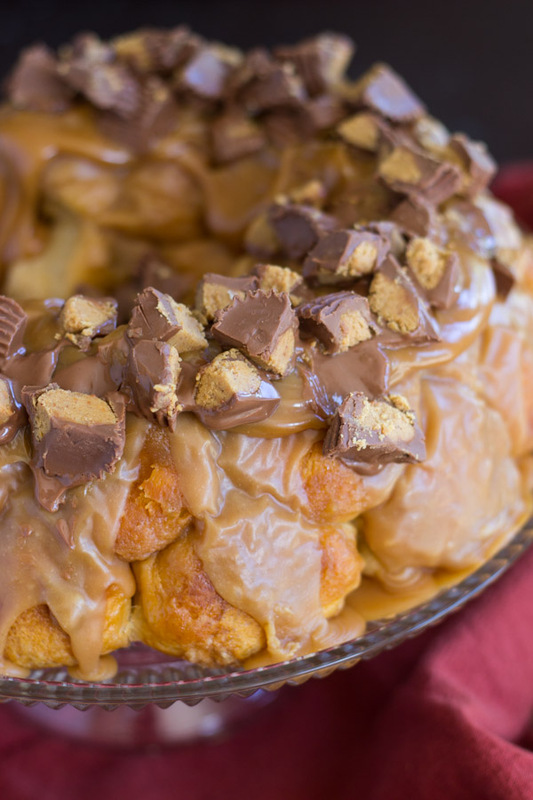 For chocolate and peanut butter lovers', this Reese's Peanut Butter Cup Monkey Bread is next level! 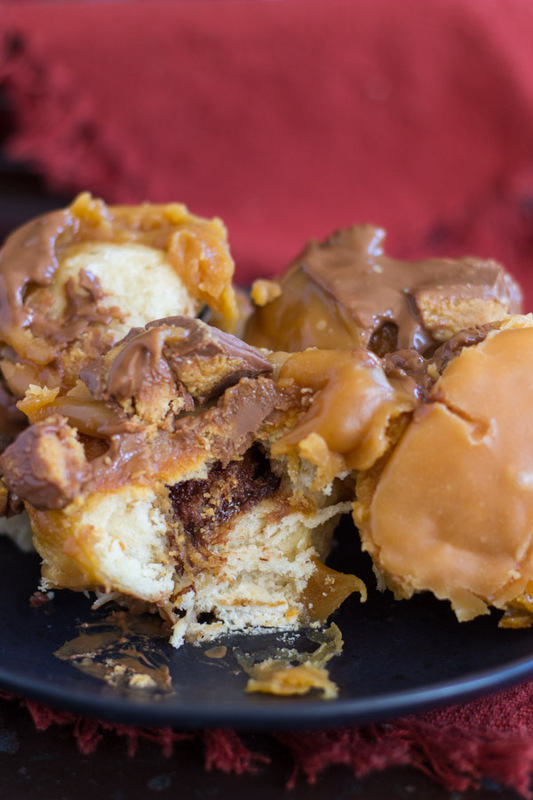 With a mini Reese's cup inside each bite of monkey bread, and drenched in peanut butter glaze, the decadence is unmatched. Wrap a Reese's cup into a biscuit half like a dumpling. Pinch the seams to make sure that the Reese's cup is covered by the biscuit dough. You may need to smoosh and spread the biscuit dough a little into a flat circle about 2-inches in diameter to wrap the Reese's cup. Arrange the dough balls in the prepared pan. Bake at 325 degrees for 40-50 minutes, or until the edges are golden brown, and when you press toward the center, it should feel 'set'. I use the end of a wooden spoon to press lightly toward the center of the bundt to check for doneness. You don't want it to feel doughy. Remove from heat, and cool in pan for 10 minutes. Run a knife or small rubber spatula along the edges to loosen the bread. Invert onto a serving platter. Do not wait longer than 10 minutes to invert, or the bread will stick to the pan. 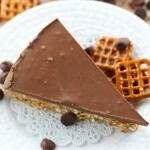 Sprinkle with chopped Reese's cups, if desired, for garnish. Individual servings reheat easily in the microwave for 20-30 seconds! 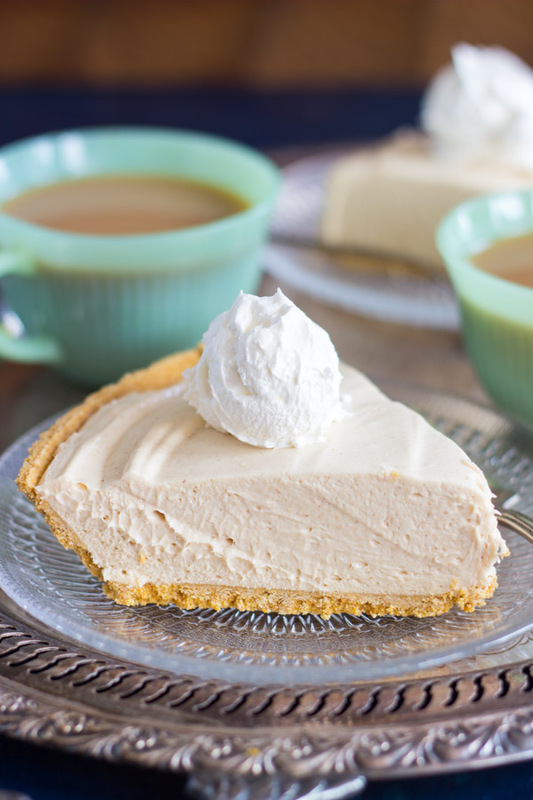 You may also like these other simple peanut butter recipes! Oh BEHAVE!!! This is absolutely unreal. Like, I only thought a breakfast this good existed in my dreams type of unreal. LOVE! LOL. I know, if only this could be breakfast EVERY SINGLE DAY! Ya, no kidding. I’d wake up an hour early just to make it every morning if my health permitted! You are killing me with this! I cannot be trusted around monkey bread OR chocolate peanut butter desserts, so this would not be safe in my presence, holy heck!